I purchased this guitar in April of this year and was immediately blown away with how beautiful the guitar is and the quality of workmanship. I must admit, I always stuck my nose up at Washburn brand thinking they were inferior instruments. This one was built in 1997 and now that I had it professionally set up the way I like them, I am even more impressed with it and especially at $400. My guitar tech was equally impressed with it...it plays great and has a great tone, besides being beautiful ! What more could I want ! I always wanted a Gibson Wes Montgomery but not willing to add another "0" to what I paid for this one ! This is their Montgomery clone. Any others out there liking their Washburn ? I also have a Washburn J6 (but not the Montgomery model). I'm not totally sure of the differences but I think the M model has fancier wood on the back. Still mine's very nice and quite playable, with the lowest action of all my guitars. Has a bit of a "thunk" to the tone, which some love (though I'm moving away from). It's my wife's favorite of all my axes so I keep it around even though I don't play it that often. 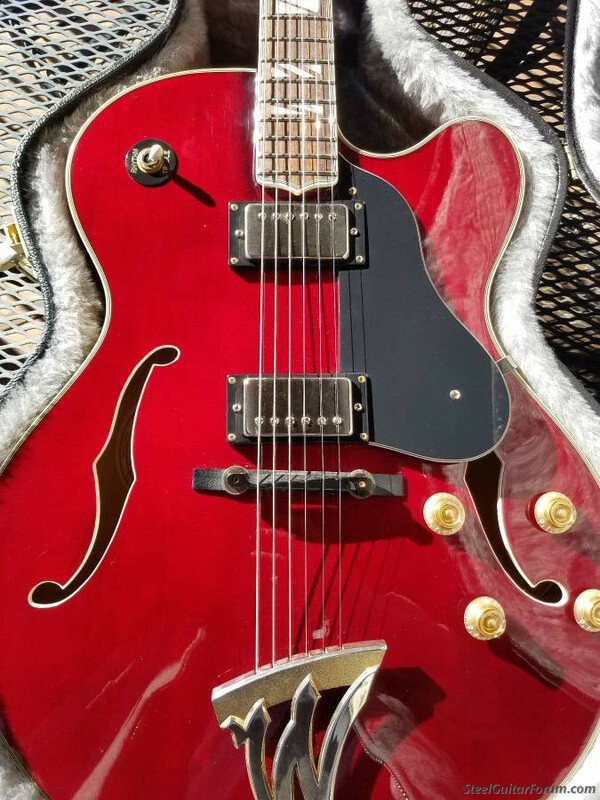 Only thing is that it has scratchy pots that should probably be replaced and a previous owner put a Bigsby on it that's not too appropriate for my style of playing (I think he played rockabilly). A Washburn rep told me it was built in 1998 and the serial # is 8414 (what's yours?) I also paid $400 for mine. I have actually been using mine lately for playing the "Chet style" stuff that I do...it has nice bassy sound for the alternating bass playing...at least to my ears. Hope to see you and hear you play in Phoenix in January. Thanks for taking the time to post a reply ! I enjoy listening to your jazz on your 6 string guitar, on the rare occasion I have heard you play it at a booth at one of the shows. You are an amazing musician.